Living in rural Thailand has it’s pros and cons, but one of the pros has been access to traditional Thai food, unadulterated by or for Western sensibilities. This has changed my palette somewhat – food without proper spices or kick have become bland, Thai food has fired up my tastebuds and also helped me discern flavours. Watching stall holders and shop owners cook has also indirectly taught me techniques and ways to use ingredients. 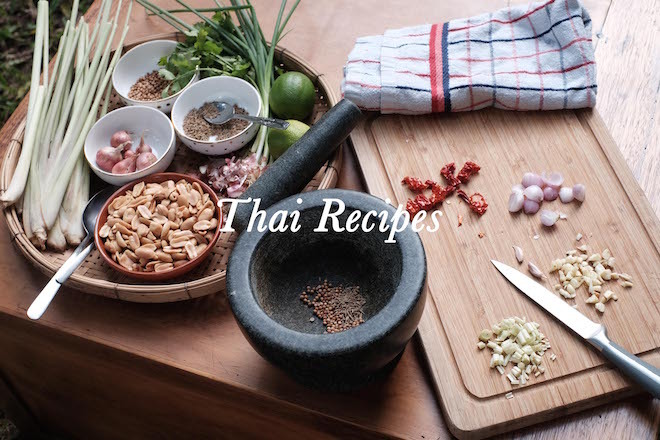 As time passes I have put together a list of Thai recipes I would like to learn, and many already have made their way into our kitchen and table. So here I will keep my collection of favourites, recipes that I make often or continue to go back to. By the time our adventure in Thailand is complete, I hope to make Thailand’s incredibly rich food culture my biggest souvenir. 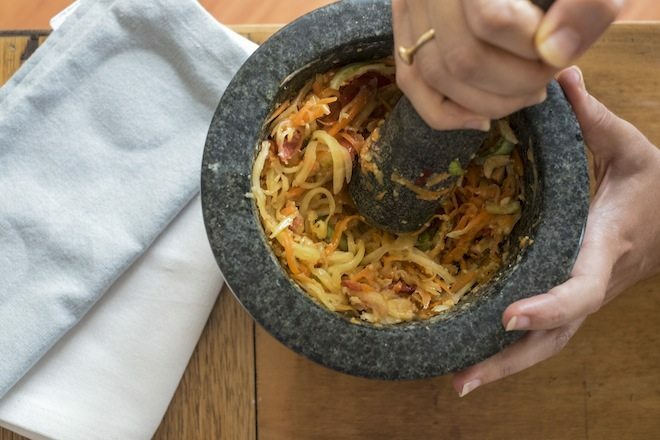 As my collection increases, I will add my favourite Thai recipes below, but do let me know if there is a particular dish you would like to know how to make and I’ll do my best to find it for you. In the meantime enjoy making these mostly simple to make and flavour-full dishes. Khai Jiow (Thai omelette) is a common offering at local Thai markets. 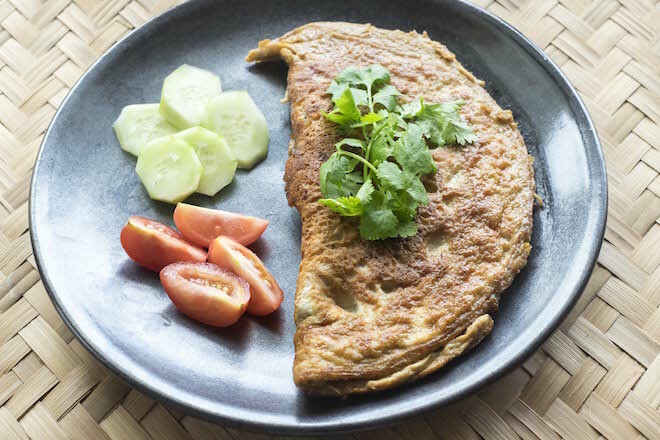 Often cooked in a wok – Thai omelette is a quick and filling meal, eaten with rice and a few light garnishings like cucumber and fresh coriander. Made at home, Thai omelette is a ridiculously quick meal to prepare and put together, the perfect meal for one or a great starter to share. This is the most basic recipe for the Thai omelette and many more ingredients can be added, like spring onion and diced tomatoes. Experiment with the filling and see which you prefer. MAKE IT HERE. Charcoal BBQ’ing is a common offering at night markets all across South East Asia. 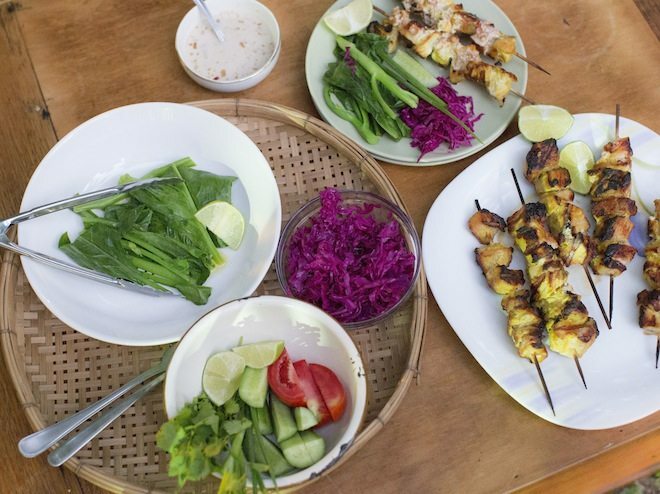 In Indonesia you will see delicious satay’s sizzling on hawker grills, in Vietnam the meat served to you to make DIY rice paper rolls, Nem nướng (meatballs or sausage), will be chargrilled. Here in Thailand – pork, chicken, salted fish and animal organs will be marinated with a host of herbs and spices and grilled to perfection. Thai BBQ pork is a dish I was taught on my first visit to Thailand back in 2004/5. The pork meat can be easily substituted for chicken or even fish – the sauce is delicious. This is a fabulous dish for two people and served with one or two fresh salads is surprisingly filling. MAKE IT HERE. Tom Yum, Thailand’s famous hot and sour soup has got to be one of my all-time favourite Thai dishes. All the elements of Thai cuisine gather together beautifully in this sweet, salty, hot, sour concoction bursting with flavour, aroma and texture. 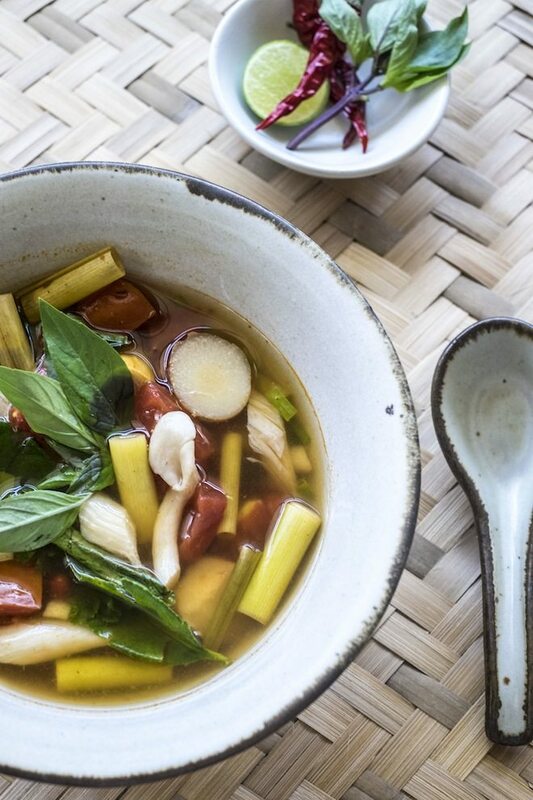 You can serve Tom Yam with Mushrooms on its own, or accompanied with rice. Enjoy this beautiful, comfort dish. MAKE IT HERE. Som Tam, spicy green papaya salad, is one of the most well known dishes in Thai cuisine. A specialty of Northeastern Thailand but served all over the Kingdom and even South East Asia, it combines all the principles of Thai flavours: salty, sweet, sour and salty. It comes in many variations including a fried pancake version (Som Tum Tod) but the most common raw versions include ingredients like peanuts and/or crab. The crab versions are a little too salty for my palate so I stick to this one which I make at home. I’ve based it on what is served at our local night market (addition of Thai eggplant for example), and my own tastes. Som Tam salad is refreshing and flavourful and a perfect side dish for BBQ’s and summer dinner parties. MAKE IT HERE. N.B – For maximum flavour and results, this salad requires a mortar and pestle – preferably a large wooden one! Dried shrimp is traditionally used in this recipe, as well as long/snake beans but I omit them in this version. 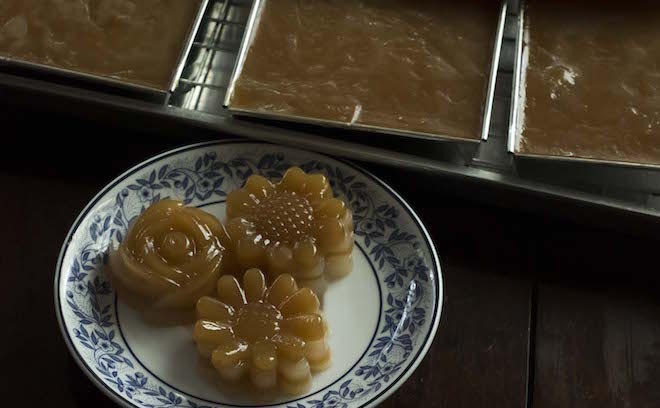 Khanom Chan is a steamed Thai layered dessert. 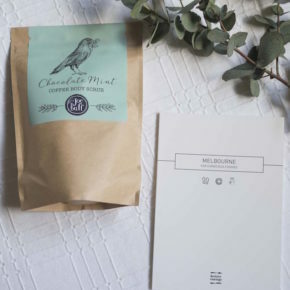 It is made by pouring a flavoured sweetened coconut milk mixture and steaming it in small metal or silicon moulds, then layering it with an unflavoured/coloured sweetened version of the same coconut milk mixture. This layer by layer steaming method produces a beautiful effect and contrast of colours -chewy in consistency like a soft gummy bear, and when made well the layers can be pulled apart individually like soft fruit leathers. MAKE IT HERE.